4->5. 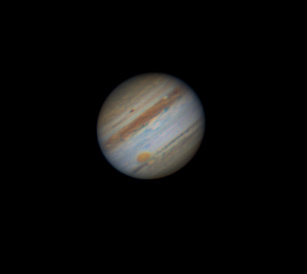 Sep-2010, Jupiter Lum(mix of R,G)-RGB picture taken with LX200ACF 16" F10, DMK31 camera, sub-frame size 1500. Castrator, AutoStakkert, RegiStax5.1, ImagesPlus and Adobe Photoshop CS4 programs used in data processing.